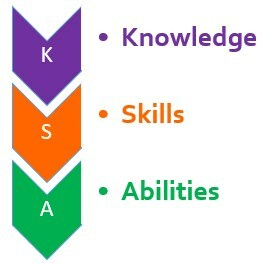 Knowledge, Skills, and Abilities (KSAs) are categories of qualifications and personal attributes that an individual needs in order to effectively perform the duties of a specific job. Usually, the hiring organization will create a list of KSAs as a guideline to help identify the ideal candidates for a position. Knowledge refers to the factual and procedural information a person acquired through education or experience. It can be obtained from reading reference material, attending a training class, or direct experience. Knowledge is the theoretical or practical understanding of a concept or subject. It can be measured with written or oral exams where a person documents or explains what they know about the topic. A person can gain additional knowledge or understanding by applying what they know and learning from that experience. However, having knowledge of how to do something does not necessarily mean that a person can do it. A person may have an understanding of a topic and all the steps involved in the process, but have no experience applying it. Skills refer to the proficient and effective use a person’s knowledge and abilities in performance that can be measured in time and precision. They are the capabilities or proficiencies a person acquires through deliberate, systematic, and sustained effort in order to effectively carryout activities or job functions involving ideas, things, and/or people. It can be further developed through training and/or hands-on experience. Skills can be measured and observed. A test can be used to measure quantity and quality of performance. Abilities are the qualities or attributes of being able to perform an observable activity. Abilities tend to be innate traits that a person possesses or acquired without formal instructions. These include areas such as talent and emotional intelligence. Abilities are much harder to teach, test, or measure then skills or knowledge. Abilities are often confused with skills, yet there is a significant difference. Abilities are natural or intrinsic, while skills are learned behaviors. Additionally, a skill can be taught, tested, and measured. However, abilities are a broad term for human capacity that are harder to teach, test, or measure. Skills are a composite of abilities and knowledge. Basically, ability and knowledge combine to create skills that can be applied. Skills can be developed and improved over time. However, the underlying abilities and knowledge are needed in order for the skills to be further developed.